PROinSENER ENERGÍA. Cooling the control cabinets for a 50 MW photovoltaic plant in the Philippines. A 50 megawatt solar power plant was built in Palo, Leyte Island, and linked to the power grid of the National Grid Corporation of the Philippines in March 2016. 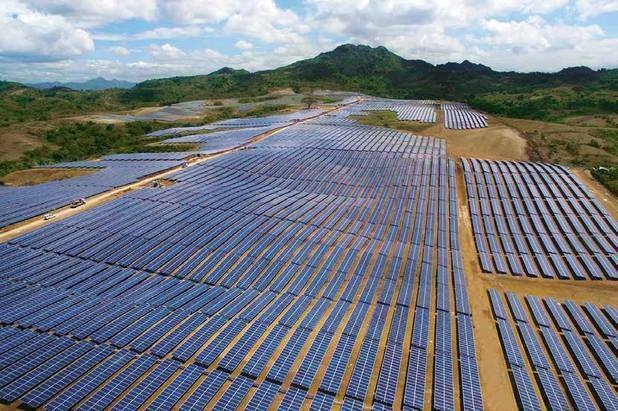 It is the second solar farm built in Eastern Visayas after the one in Ormoc City. Now, with three power sources of NGCP in Leyte, together with the geothermal plant at Tongonan in Kananga town of Leyte, there is enough providers for the energy needs of Leyte and Cebu. The new solar plant consists of 188,000 solar panels built on a 70 hectar property located about eight kilometers inward from the main highway. PROinSENER ENERGÍA is a Spanish provider for containerized solutions They design and manufacture transformer stations, solar inverted stations, electrical rooms, electrical panels and other containerized solutions for different applications: renewable energy, mining, water pumping stations, emergency units, etc. PROinSENER has more than 400 MW installed worldwide, from the Philippines to Chile, with projects in Jordan, Morocco, Brazil, etc. PROinSENER has supplied 15 inverter stations in 40’HC containers. Each of them generates 2.8 MW for the 50 MW PV plant in Leyte Island. Philippines. Each control cabinet in these stations is provided with Pfannenberg’s 4th Generations Filterfans. After evaluating different options on the market, PROinSENER’s choice fell on Pfannenberg’s original filterfans. When it comes to safe and cost-effective cooling of control cabinets with filtered ambient air, our filterfans are the first choice. Since Otto Pfannenberg invented it in 1958, they have held a leading position in the market. The latest generation is even expanding this lead – with no fewer than 11 patent protected features as for example the closed housing, which reaches guaranteed high system of protection IP 54 and IP 55, or the fluted filter mat which, in the IP 55 model, keeps the volume flow constantly high but increases the service life (time between 2 mat changes) by 300 %. Our εCOOL series sets standards in terms of capacity, cost-efficiency and maintenance friendliness. PF 65.000 – 505 m3/h Outdoor filterfans IP 55 for demanding indoor and outdoor applications. UV protected. Control cabinet cooling in solar inverter containers. Photovoltaic plant in Leyte Island , Philippines. N. 30 PF 22.000 IP 54 + n. 30 PF 65.000 IP 55. High quality products with the highest level of protection for extreme conditions. Long term agreement with Pfannenberg regarding warranty and worldwide support.